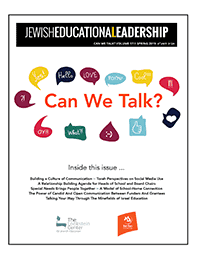 The publications of The Lookstein Center are designed to nurture and strengthen professional development and create new perspectives among Jewish educators. Below are The Lookstein Center’s publications currently for sale. The eleven thought-provoking papers in this volume were originally presented at a conference sponsored in 2005 by the Lookstein Center for Jewish Education in the Diaspora with The Shul in Bal Harbor, FL. They touch upon core issues facing Jewish educators today: identity development, Jewish identification, the impact of media and Internet use on Orthodox Jewish youth, challenges in teaching universalism in a particularistic culture, teaching Judaism in a post-modern world, educational implications of the 2001 Jewish Population survey, Zionist attitudes among yeshiva students in Israel, and more. To purchase Lookstein Center publications, please click here.